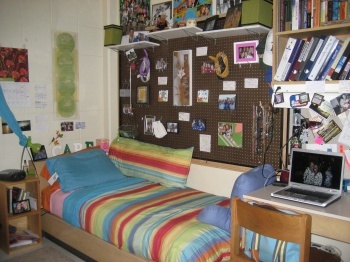 You should be able to get your dorm room dimensions on your college’s website. Look to see what else they provide…a desk? Possibly a desk with a file drawer? A bulletin or peg board? A drawer/dresser unit? Is there a sink in the room? Is there room for under the bed storage? Of so, it is a great spot for storing extra sheets, blankets, pillows, etc. How big is the closet? Are there shelves in the closet? 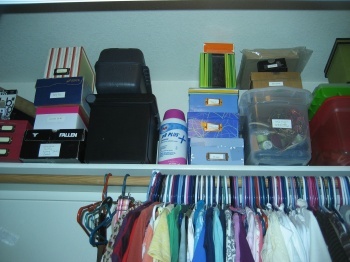 Once you’re unpacked you can use this high and frequently wasted space for storing low use items and your packing totes or traveling suitcases, etc. Make use of vertical space on walls and doors as much as possible. Hanging bookshelves and stackable crates also make great use of vertical space. Of course you’ll want to personalize your room but keep in mind how small your space will be and try not to bring too many knick knacks, etc. 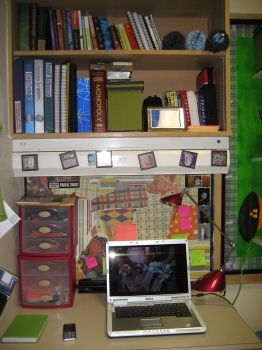 here again, try to think “dual purpose” or “contain.” Hang photos, artwork, etc. Bring a cool lamp, colorful floor chair/ bean bag, etc, or a carry tote that holds bright markers. Add fun little magnets to your mini fridge which can be part of your décor and serve as a place for notes and to do lists. Bulletin boards come in a variety or styles and can be changed seasonally or whenever the mood strikes you. Get a hamper that you can also use as a bed side table. Use a Swiss ball for your desk chair. Baskets can add personality and are great for holding a lot of things from socks to books.